When I Dream is an interesting storytelling deduction party game for 4 to 10 players. Players take turns as the Dreamer who places a mask over their eyes. 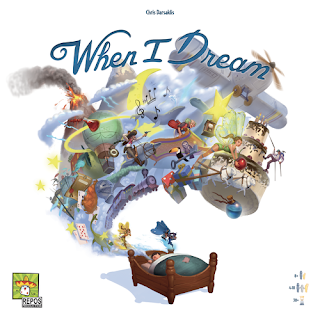 The other players are Dream Spirits who each use a single word to describe the same card. But beware the Sandman and other Boogeymen who will try to lead the Dreamer astray. 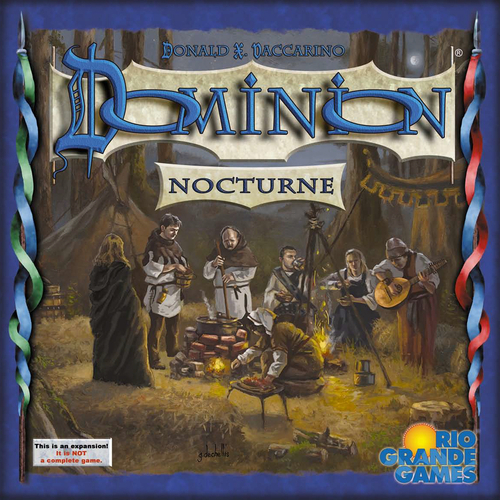 Nocturne is the latest and the 11th expansion to the deck-building game, Dominion. 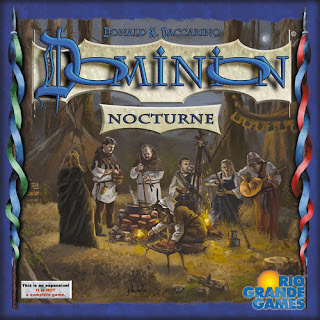 This expansion comes with 500 cards, with 33 new Kingdom cards that include Night Watchman, Pixie, Pooka, Raider, Sacred Grove, Secret Cave, Shepherd, Skulk, Tormentor, etc. There are Night cards and a Night phase, played after the Buy phase. There are Heirlooms that replace Copper. Fate cards providing Boons as well as Doom cards that give Hexes. You have 3 Zombies too, an apprentice, a mason, and a spy with some Imps, Will-o'-Wisps Wish, and more thrown in. Holiday up your Catan game this season with the Santa Scenario. Santa needs wool for his new coat and the coats of his elves. 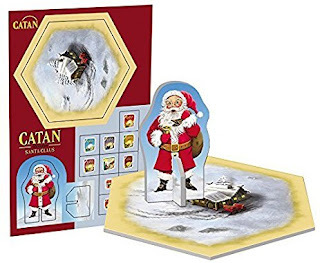 If you give Santa Claus wool on your turn, you may move him to a hex on the island of Catan. Once he arrives on the hex, he gives the settlers Christmas gifts and may even chase away the robber and/or to protect a hex! This expansion increases the strategic value of wool, which in the basic game is considered the least attractive commodity. This variant scenario is suitable as an add-on for up to 6 players and all expansions that include the robber. 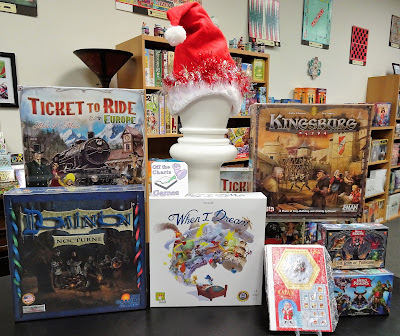 Kingsburg has changed publishers. It is now published by Z-Man Games. 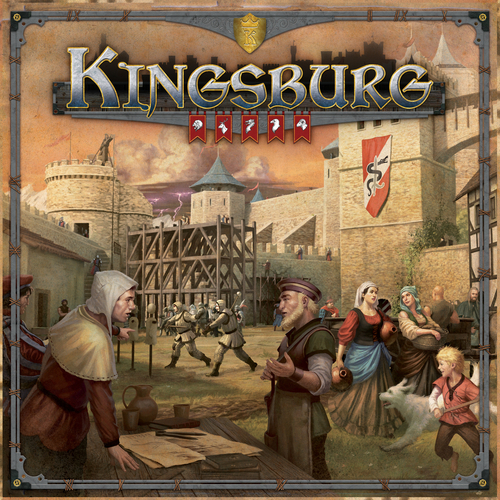 Kingsburg 2nd Edition not only has new artwork but includes all 5 modules from the To Forge a Realm expansion and a new module: Alternate Advisor Rewards. This is still the same worker placement game where players influence the king's advisors to gain resources, develop their province, and defend it from ruthless invaders. After 5 years of governance, the player with the most prosperous province wins. Gather your friends. Choose your characters. Fight together against deadly foes. 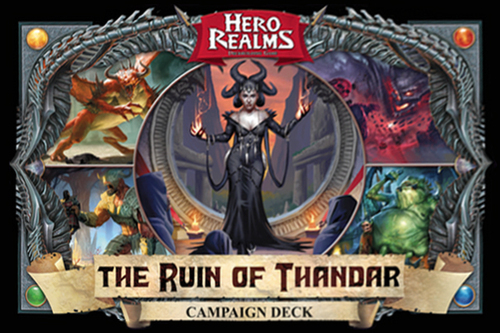 The Ruin Of Thandar is an expansion for Hero Realms. It transforms the game into a cooperative, adventuring deck-building game. Go on a quest with your team of heroes. Complete missions and earn experience points that you can spend between sessions to gain new skills and abilities. Win precious treasures including powerful magic items that you can add to your character's starting deck. This expansion requires the base game, Hero Realms, and Character packs.